This local family-run restaurant with a friendly atmosphere serves some of the best Thai cuisine to be found in relaxed, informal surroundings. All dishes are freshly prepared to order and the menu includes a range of starters, soups and salads, stir-fries and curries, rice and noodle dishes. To get the taste buds going try the Dan Thai Platter for starters with a selection of chicken satays, spring rolls, prawn toast, chicken wings and fish cakes – a feast in itself! 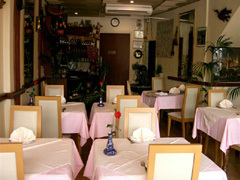 Open Mon-Fri noon-3pm and 6-11pm, Sat-Sun 6-11pm (Sat-Sun lunch by arrangement for parties). All major credit cards accepted (except Diners). No service charge. Great food and good value for money. Service is good. Highly recommended.